A round up on what’s happening at the TV News Archive by Katie Dahl and Nancy Watzman. This week, we present a Washington Post analysis of coverage of an alleged affair by the president; a Vox piece examining coverage of Andrew McCabe, the former deputy FBI director; and The Toronto Star’s use of a salient clip to illustrate a point about a presidential appointment. We also show fact-checks from FactCheck.org, PolitiFact, and The Washington Post’s Fact-Checker on claims related to banking, public lands, and trade policy. 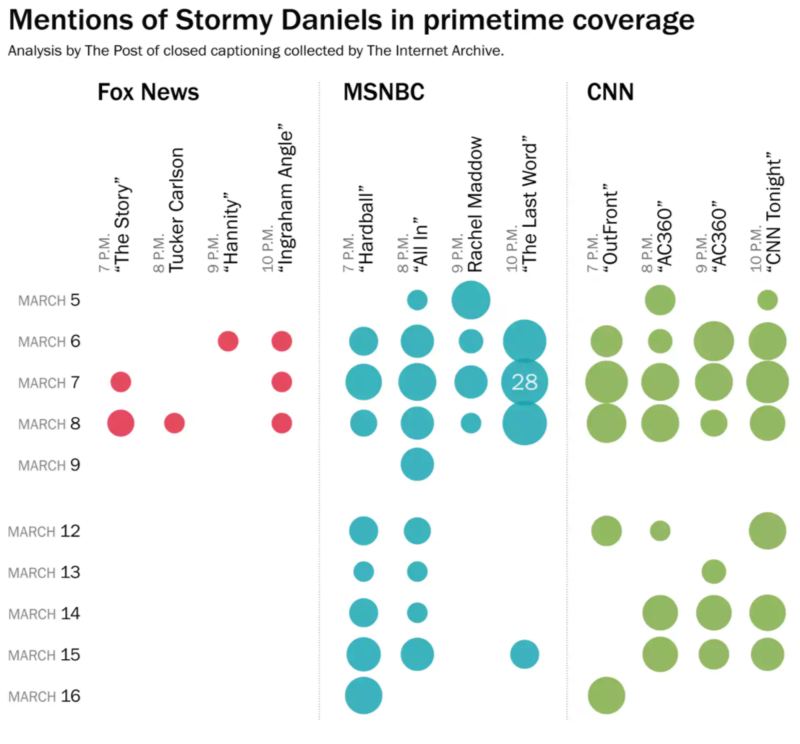 CNN and MSNBC hosts and guests are talking a lot more about the alleged past affair between President Donald Trump and Stormy Daniels than Fox News is, according to Philip Bump’s latest analysis for The Washington Post using TV News Archive data via Television Explorer. 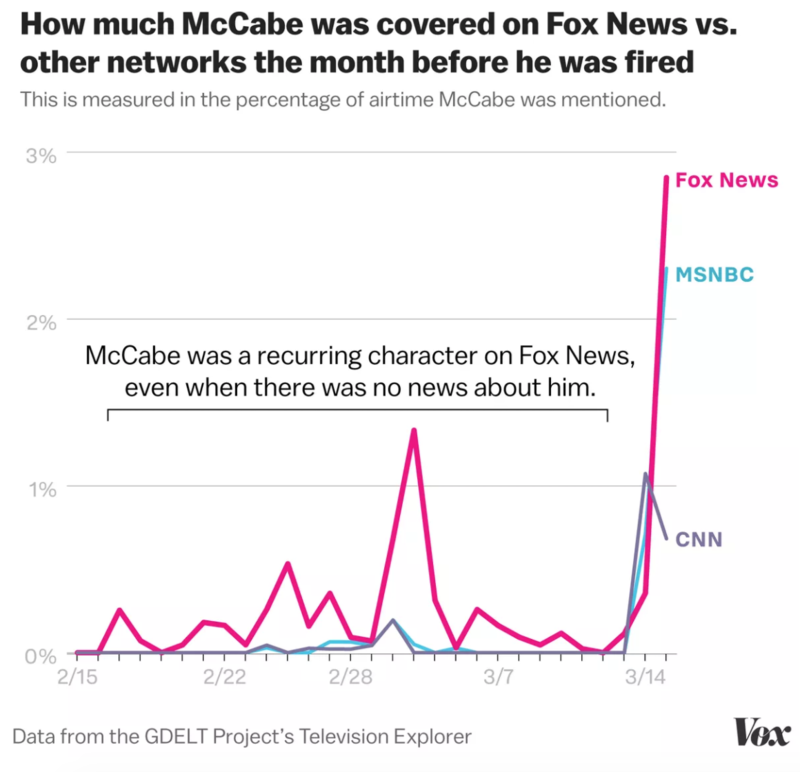 Did Fox News reporting contribute to perception of fired FBI official? The Toronto Star embedded a TV news clip in a piece on Trump’s pick to replace his economic advisor. Larry Kudlow, who is taking over from Gary Cohn as economic advisor, had said of U.S. trade policy: “NAFTA is the key. And unfortunately we’re going after a major NAFTA ally, and perhaps America’s greatest ally, namely Canada. Even with this left-wing crazy guy Trudeau, they’re still our pals. They’re still our pals. Why are we going after them?” The clip has been viewed more than 112,000 times and counting. Manuela Tobias reported for PolitiFact: “The bill raises the bar of what is considered a big bank five-fold, which effectively relaxes the standards for large regional banks. Experts warn this also could open a door for bigger Wall Street bank giveaways. Glenn Kessler reports for The Washington Post’s Fact Checker that the president is not including services in his analysis of the trade relationship with Canada. He adds: “The president frequently suggests the United States is losing money with these deficits, but countries do not ‘lose’ money on trade deficits. A trade deficit simply means that people in one country are buying more goods from another country than people in the second country are buying from the first.” Kessler gives the claim four Pinocchios. Follow us @tvnewsarchive, and subscribe to our biweekly newsletter here. This entry was posted in News, Television Archive and tagged Andrew McCabe, banking, Donald Trump, fact checking, Factcheck.org, FBI, PolitiFact, public lands, The Toronto Star, The Washington Post, The Washington Post's Fact Checker, trade, Vox. Bookmark the permalink. Thank Nancy Watzman! Your information is very helpful for my report!